Fiona Browne graduated from the Samuel Beckett Centre, TCD in 1995. Theatre highlights include ‘Doomraider’ (Fishamble dir: Gavin Kostick), ’44 Sycamore’ (Lane Productions dir:Jim Nolan), Jekyll and Hyde (Channel Theatre UK), 11:58 (dir:Rowan Tolley, UK Tour) and Mrs Brown’s Wedding (dir: Brendan O’Carroll). 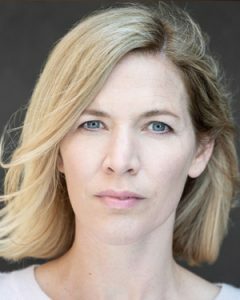 She has also written and performed two solo shows ‘Rainy Days and Mondays’ (Bewley’s Cafe Theatre) and ‘The Whale and the Swan’ (Camden Fringe&Mayfield Cafe Theatre). TV includes Fair City, The Clinic and Trivia all for RTE, Alistair McGowan’s Big Impression, BBC and Films ‘Sanctuary’ and ‘Getting Air’. She is a busy voiceover artiste on TV and radio and performs regularly with 1960’s Motown/Soul band The Dionnes. Mind Your Fingers Amanda Bypass Alan King/Darren Thornton Drogheda Arts Fest. Kinder Klara Susie Lamb Doll Parts T.C. U.K.
Dr.Jekyll + Mr. Hyde Sarah Philip Dart Channel Theatre. U.K.
Killinaskully P.J. Eugene O'Connor Rusty Skully Prods.